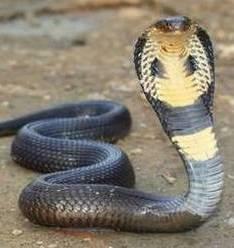 The King Cobra is a species of venomous snake. The colour is yellow, white and black. It has sharp teeth. It has 0 legs. The skin is bumpy. The king cobra is the world’s longest snake. Mature cobras have a slow metabolism which means they can live for days or moths without a meal.